1. I want to finish this Chain quilt. This week I pieced the back and basted it so I'm ready to get quilting. I'm just going to echo the zig zags. It'll be tedious but my Tivo's starting to fill up so it'll give me plenty of time to catch up. 2. I also want to finish my Hello Luscious Twister. I'm going to schedule longarm time to quilt this one and I need to order fabric for the outer border and backing but I made the binding for this and my Chain quilt so I'll be ready once they're quilted. OOOO, love it! I haven't seen this chain pattern before, or maybe it's cuz the fabrics are so nice. Anxious to see the finish! Well I think this is my first time stopping by here....glad I did. I find it difficult to visit everyone some nights...just doesn't happen. I really love your chain quilt...beautiful colors. I love Lee's Chain pattern -- your choices with it look so good! Really like your chain quilt, great colours. I like to have some hand sewing or quilting ready to do as it's so portable. I usually take some paper piecing with me when I'm away just in case I have spare time to fill in. 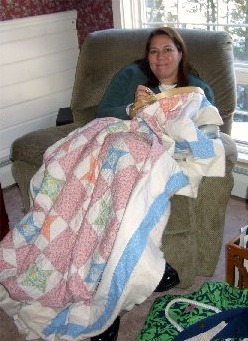 Love the chain quilt, I haven't seen that pattern before. I also like the Luscious Twister quilt - very cool technique! I hear you on the hand quilting. Road trips are when I get most of my quilting done. Less distractions! Did I already say I love your Chain quilt? LOL! 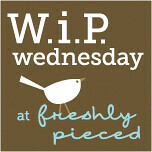 W.i.P Wednesday: Whole Lot of Quilting Going On!